Harlan T Mussman, age 94, lifelong resident of Steele County, died April 27, 2018 at Homestead Hospice Care in Owatonna. Mass of Christian Burial is set for Monday, April 30, 2018 at 11:00 am at St. Joseph Catholic Church, Owatonna. Friends may greet the family on Sunday, April 29 from 2:00 - 5:00 pm at the Brick - Meger Funeral Home and one hour prior to the funeral at church. Knights of Columbus Rosary will take place at 5pm on Sunday at the funeral home. Harlan was born April 4, 1924 to parents George and Margaret (Dunker) Mussman. He attended Havana township grade school and graduated from Claremont high school. He married Dona Erding May 30, 1952 at St. Joseph Catholic Church in Owatonna. Harlan farmed at the family homestead. He and Dona moved to Owatonna in 2012. His hobbies included playing cards, hunting, bowling and fishing with his sons in Alaska. He volunteered with meals on wheels and served as a KC member for over 60 years. Harlan enjoyed working at the Steele County Free Fair with the Knights of Columbus. 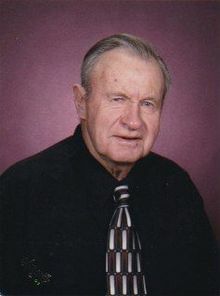 He survived by his wife, Dona, of 65 years; daughter, Jane (Bill) Butler, of Oakdale, Mn; sons, Steve (Mary), of Soldotna, AK, Greg (Janell), of Maple, WI; 10 grandchildren; 13 great-grandchildren; three sisters, Betty Krause, Barbara Rodgers and Glodean Welch of Owatonna, and many nieces and nephews. He was preceded in death by parents. In lieu of flowers, memorials are preferred to Homestead Hospice Care or the Steele County Historical Society.